It’s that time of year, when we all start stocking up on baking supplies, hoarding pumpkin puree cans like it’s going to save our lives, and purchasing containers that would making great shipping vessels for the holidays. I’m not one to fall behind, so this week I started making some cookie doughs, freezing them, and having them ready to ship come the time. This past week I’ve been testing out the new EatSmart Precision Elite Digital Kitchen Scale and as soon as I received it, I had to compare it to my trusty Escali scale. Quickly, I instagramed THIS picture and it’s obvious; my Escali scale looks like a baby’s scale next to the brand new EatSmart Scale!You might ask, does size matter? Not always of course, but in this case, having a larger scale makes it easier to measure ingredients in large bowls that normally don’t fit on the scale, or cover up the screen, making it impossible to work with. The EatSmart Precision Elite Digital Kitchen Scale is just that, elite. With a capacity of up to 15 pounds (and honestly, at home baking rarely reaches that much at one time! ), this might just be the only scale you need. 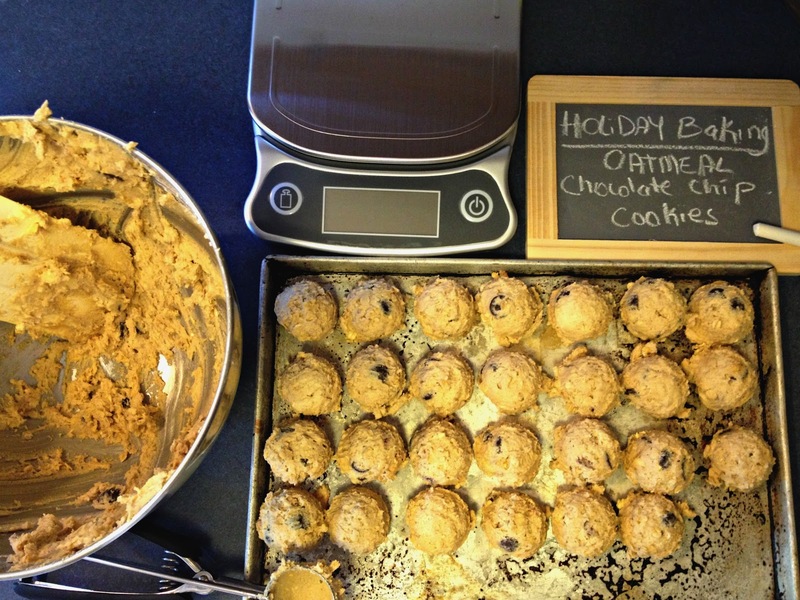 Measures in grams, ounces, and pounds – which is why it’s great for holiday baking! I also love how sleek looking it is, perfect appliance to leave out on the counter. When I created this recipe, it was created in cups and teaspoons at first. This time around, I converted mostly everything to ounces using this scale, making it a recipe that is consistent always and I can look back on ten years from now and know that since it was scaled in weight measurements, the proportions will always be the same and the results will be identical at all times. Also, if you’re interested in purchasing this EatSmart Precision Elite Digital Kitchen Scale, be sure to head on over to Amazon and grab one. They make the perfect gift for the baker or cook in your life. Follow EatSmart Products on Facebook, Twitter, and Pinterest for new recipes, product updates, and more! Why make Oatmeal Raisin Cookies when you can make Oatmeal CHOCOLATE CHIP cookies? 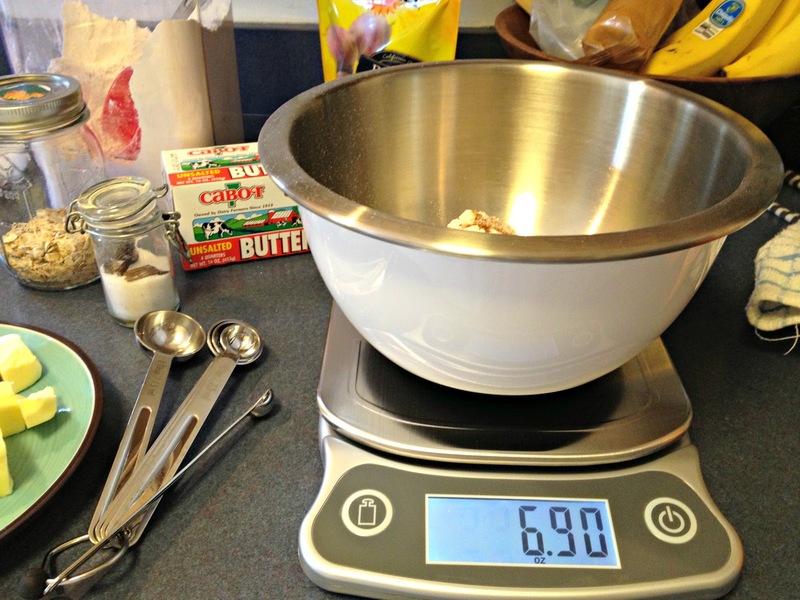 Measure out flour, baking soda, nutmeg, salt, oats, and chocolate chips all in one bowl. Reserve. In a mixer, cream butter and sugars until fluffy and lighter in colors (about 5 minutes). Add eggs and mix until fully incorporated. Dump entire bowl of dry ingredients and mix just until combined. Do not overmix. Using an ice cream scoop and small tray, scoop cookies onto tray and freeze for 1-2 hours. Remove cookies from tray and divide into labeled freezer bags. Now they'll be ready for when you are ready to bake! Baking Instructions: heat oven to 350F, placing cookies on greased sheet tray with enough space in between. Bake for 12-20 minutes, depending on your oven, until golden brown. Disclosure: Scale was provided free of charge to facilitate this review. And honestly? I love it so much more than my Escali scale, which says a LOT because I’ve love it for a few years now. Oh this is delish! 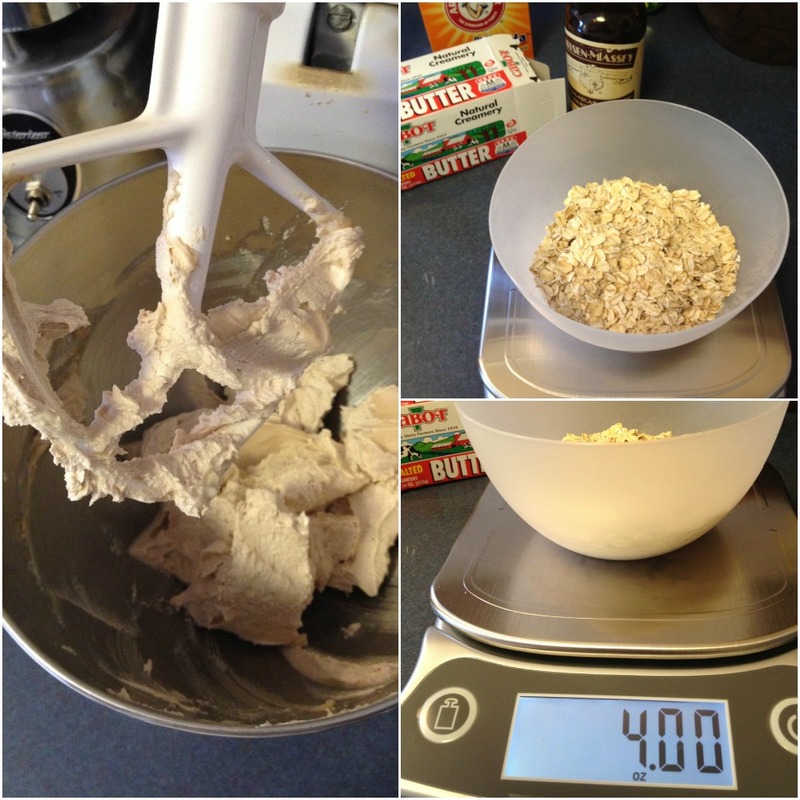 My hubby loves Oatmeal Cookies and I’m in constant search for a great recipe. I will definitely try yours. Thanks for sharing, Nelly! Thanks for all the RTs & kind support. Love & Hugs Hope you had a fabulous Thanksgiving with the family! I’m glad you like the scale, this is the same one I have been thinking about getting, thanks! That scale looks awesome! And the cookies look/sound delicious!